The webcam has become an essential accessory for every computer user. The tiny camera above your monitor helps you chat and ‘hangout’ with all your friends from across the world or turn it into a security spy camera. Another great thing about webcams is that they help you snap your own picture without getting up from your chair. For workaholics, a webcam is a great tool to stay in touch with their colleagues and even hold meetings with them. Being this indispensable, the software for it has to be just as good as the hardware. For Linux users, that wasn’t always the case until mainstream applications like Cheese came out. Since then, the penguin has been very friendly to the webcam. In fact, I was pleasantly surprised when my PlayStation-Eye camera, which refused to work on Windows (without a driver), worked flawlessly from the instant I plugged it in. So, if you’ve just plugged in your shiny new webcam and are looking to snap pictures or shoot videos of yourself, then here are some of the best webcam software applications for Linux. We’ve already reviewed Cheese thoroughly before, so I won’t talk much about it in detail. Cheese is undoubtedly the best webcam application for Linux right now. It has all the features you want and more importantly, it is mature and stable. Moreover, It was a part of Ubuntu's default application set for quite a while, so its popularity cannot be overlooked. The best thing about Cheese is its ability to add funky effects to your images in real-time, making it one of the most fun applications to try out. The project is actively developed; the latest stable version was released in July 2011. 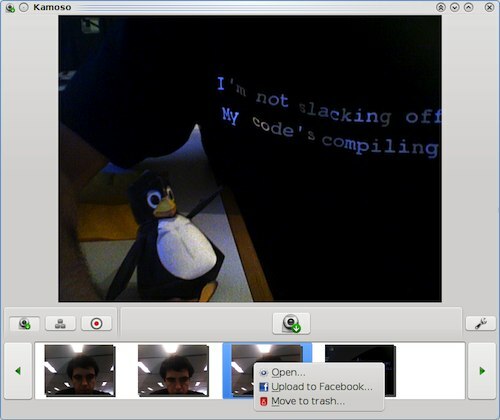 Kamoso is a Qt little webcam application for your Linux desktop. Though not as feature-loaded as Cheese, Komoso is still pretty good application if you’re looking to take pictures or videos of yourself. The interface is as simple and the whole UI is without any bells and whistles whatsoever. Once you take a snap, you can then upload it to the web by a simple click of a button. Though still in its infancy, Kamoso is a promising software that could someday go on to become a default application for the KDE Desktop. 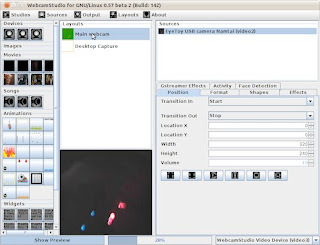 WebcamStudio is an innovative application that creates a virtual webcam that can mix several video sources together which can then be used for live broadcasting over Bambuser, Ustream, or Stickam. Let’s say you wanted to create a screencast of you using your desktop but you also want people to see your face. You can’t do that using normal recording applications like Cheese. Here’s where WebcamStudio comes in handy. The free application lets you broadcast your desktop, your webcam, a movie, text, IRC channels, RSS feeds, animations, images or all of them at the same time. 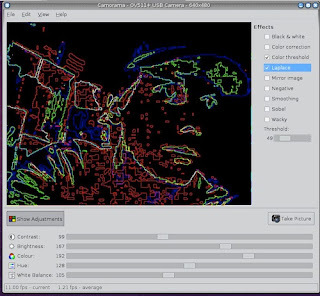 Like Cheese, you will have fun using the various GStreamer effects it comes with. 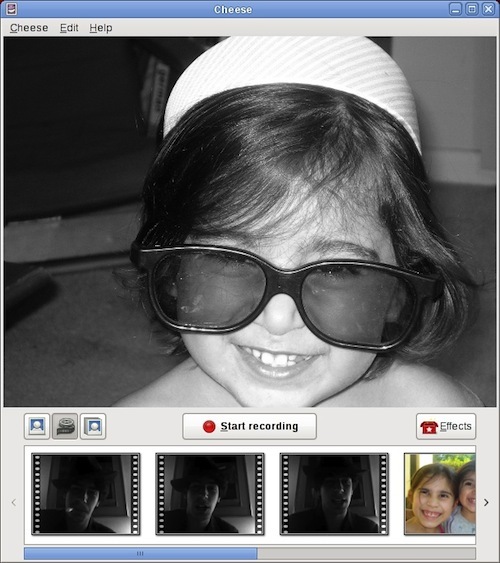 Although WebcamStudio is still a new project, it is a promising idea that could catch on once it gets more mainstream attention. As of now, if you wanted to do a show like Chris Pirillo does, WebcamStudio is the only open source software you can rely on. 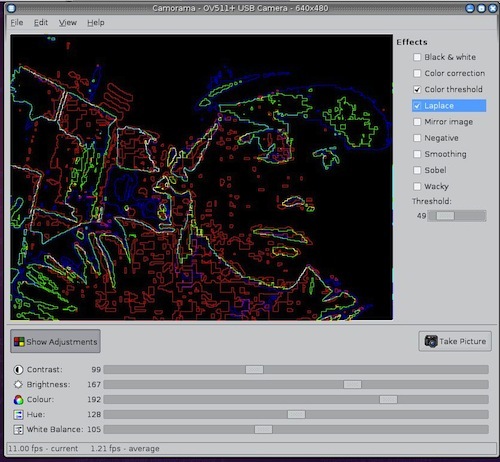 Camorama is a lightweight utility to capture and view images from a webcam or on other Video4Linux device. The user interface is simple, and doesn't give you many options to fiddle with. However, there are some features that many users will find quite useful. For example, you can alter the brightness, contrast, hue, and white balance of the image by adjusting the sliders at the bottom. Like Cheese, you can also add some interesting effects to the image. The application is not as good as the aforementioned ones but being so lightweight and easy to use; it makes a worthy addition to the list. Also, Camorama is not updated that frequently, the last update was in 2007. However, some users still might find it useful.